My most peaceful and enjoyable moments come from being surrounded by nature as I paint outdoors.The ever-changing light and colors present endless opportunities to view spectacular panorama on the east end. 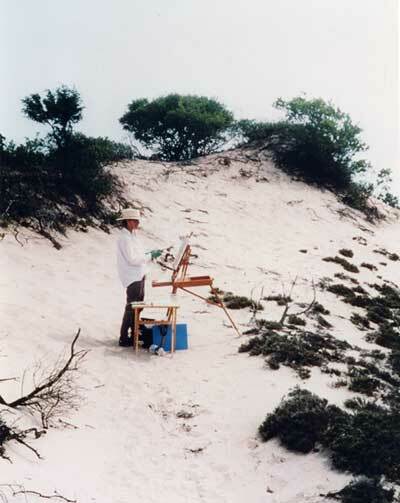 All of my paintings are done on location “en plein air”. I stop to paint when I respond to the way the light brings out patterns of colors in the landscape. I find myself returning to paint many of the same scenes at different times of the day and throughout the seasons. Each time I paint I marvel as I discover seeing something new. I love the land and I am always in awe of its beauty. Michele Margit started painting in 1995. She studied at the Art Barge with Janet Jennings, Terry Elkins, and Gail Kern. Since 2002 Michele Margit has exhibited in group and individual shows at Ashawagh Hall and Galleries on the East End. Michele Margit is an origional member of Plein Air Peconic , a group of artists and photographers on the east end raising awareness and funds for the preservation of land through art exhibits featuring Peconic Land Trusts sites that are preserved on the South and North Fork of Eastern Long Island. Before devoting full time to painting Michele Margit was a Career Counselor assisting adults with career/life transitions in a private practice and as a consultant with outlplacement firms.She was a professor in a Master’s Degree Program for Career Counselors. Michele Margit has the following degrees: Doctorate in Adult Learning from Teacher’s College, Columbia University .M.S. Counseling Degree from Long Island University .M.A. in Education from the University of California at Berkeley, and B.A. in Comparitive Literature from the University of California at Berkeley.